I've noticed that my blogpost tend to start with "It's been a while..." and it certainly has as my last post was at the start of January. Well to all my loyal followers (about 20 or so) thanks for waiting around and I hope you will like this redux to Protect your computer from yourself. But before I pointing my index finger at you again and play a bit of the old blame game let me just summarize what I have been doing this past months besides not posting here. Working is probably on top of that list and with it keeping the internet a little safer with my colleagues for everyone. That's in part why I can revisit my previous post on protecting your computer from yourself with some newish information. I've also started to get back into shape after getting home from Australia late July and hence forth being fed to much good food by my dear mother that increased my weight to much. Although having a minor injury didn't quite help and caused me to stop running altogether. I recently started exercising again. Mostly cycling to work (about 32 kilometres round trip). Besides the main objective of losing weight it should also provide me with more stamina which I definitely will be needing in due course but read on. Now let's get back to protect your computer. I've said it before and I'll say it again. You are the best defence against anything malicious that wants to invade your computer for a varying array of reasons. Be it an Mac, Linux or Windows based computer, in the end it doesn't matter much. Anti-virus software and the like can only protect your computer to a certain extend and at the end of the day those types of software are playing catch up with new ways of infection. I believe that education is the only good solution to solving the ever growing problem of malware and other cybercrime attacks besides fighting it head-on and protecting consumers from it. And I mean to educate you a bit along those lines by explaining how to keep software up-to-date on your computer. As major Linux distro's already have a centralised way of keeping your software updated and Mac isn't targeted so much anyway, this post will mostly evolve Windows machines but can be used for other operating systems as well. Although there recently was a big attack targeting Macs, called Flashback. Which makes my point straight away. Even though you keep your operating system completely updated, the software you installed (third party software) is mostly left in the cold. Windows Update only updates your Microsoft software (and drivers) and Apple isn't different in this approach. Most malware exploits software you have installed yourself and you haven't kept updated. I've seen cases of infection this year where a Java version was used that was released in 2008. That's just amazingly stupid and ridicules. If you go abroad on holiday you check your vaccinations right? Well you should see the internet the same way. You should keep software up-to-date or you risk being infected and face the consequences. Ranging from annoying advertisements being displayed, your computer sending spam without your knowledge to your entire addressbook to the worse possible scenario like stolen personal and/or financial information like passwords, creditcard details, your hard earned cash being stolen or even misuse of your identity. Got your attention? But how does one keep third party software updated? Well lets start with another approach before we start updating. I recommend removing or rather uninstalling software you don't use. My rule of thumb here is if you don't use it, remove it. If you might use it in the future you probably won't so remove it. For Windows there is a very handy tool to keep your system updated. It's very easy to use and maintain. It's called PSI by Secunia. Once installed it actively scans your computer and shows which programs need updating. It can even automaticly update those programs for you. Check out this short video of how PSI works. I wonder what your score will be? Get it to a 100 % by updating. Hopefully this will help you out a bit with updating. I also want you to take special note of the following programs that are amongst the most targeted by malware developers, namely Adobe Flash, Adobe Reader and Oracle Java. Some of these like Adobe Reader you have alternatives for and Java you probably never use so consider removing it. This is not a 100 % method of protection so keep that in mind. And don't forget about the pointers I posted about in Protect your computer from yourself. 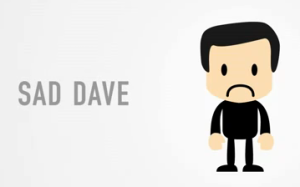 Don't be sad Dave.